Since January 2017 ATPDesigner will be offered in collaboration with the power utility VSE AG as part of the software tool GridProtect. Nevertheless you can get detailed information if you send a e-mail to michael.igel@htwsaar.de. A time limited license for up to 12 months will be granted only for Non-Profit Organizations for scientific or educational purposes, if this organization is a licensed ATP user and a member of one of the ATP User Groups worldwide. What does NON-PROFIT ORGANIZATION mean in this context ? A non-profit organization is an organization, whose objective is to support some issue or matter of private interest or public concern for non-commercial purposes, e.g. universities or other educational organizations. You will receive the PASSWORD by e-mail, after the order process had been successfully finalized. After restarting ATPDesigner will ask you only once to enter the LICENSE NAME and the PASSWORD. Thereafter ATPDesigner will start without asking LICENSE NAME and PASSWORD. Read more details and see snapshots of the PASSWORD settings dialog in the help file. Your LICENSE NAME must be identical with the USER NAME you use to be logged in to the Windows OS. Your PASSWORD will be created based on your LICENSE NAME. During startup ATPDesigner checks, whether your current user name is identically to your LICENSE NAME. Your PASSWORD will be created based on your LICENSE NAME. How to use License Name and Password ? Now it will be explained how to use the license information after receiving them by e-mail. 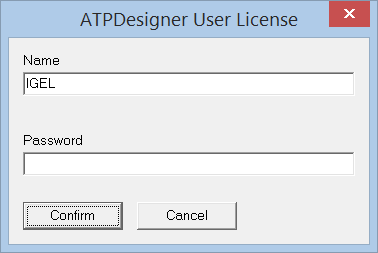 ATPDesigner automatically opens the settings dialog ATPDesigner User License. Please note the user name shown in the edit field Name. Send the user Name or a snapshot of the settings dialog ATPDesigner User License via e-mail to michael.igel@htwsaar.de including the request for a life time license. The life time license will be send back to the e-mail address received from you with your order for the life time license, if the order process has been finalized. If you receive the license information via e-mail, start the procedure explained above and write your license information in the both edit fields Name and Password. After a left mouse buton click on the Confirm button the file ATPDesignerReg.ini will be created and ATPDesigner starts. How to check the License Information ? 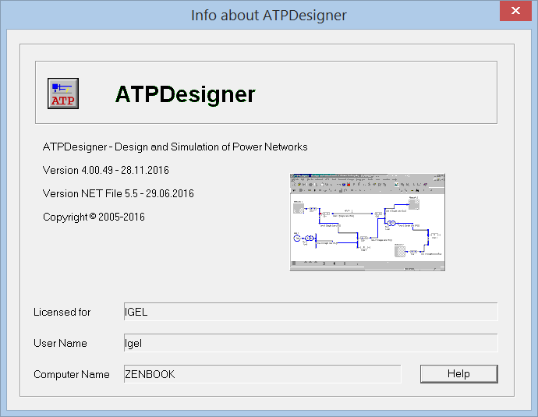 The license information can be checked in the Info about ATPDesigner dialog.